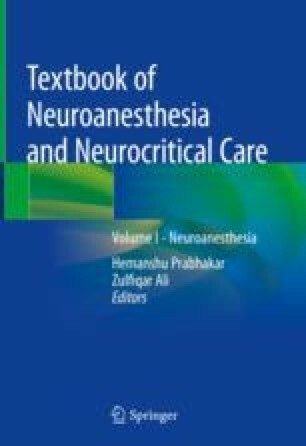 Anesthesia for aneurysmal subarachnoid hemorrhage is particularly challenging for the anesthetist. It is an emergency procedure that has to be performed as soon as possible to prevent aneurysm rerupture, in patients who may have multiple organ dysfunction. In good-grade patients (Glasgow coma score 13–15), the main objective is to prevent rebleeding by achieving hemodynamic stability both for surgery and interventional neuroradiology. Bad-grade patients (Glasgow coma score 3–12) usually have moderate to severe intracranial hypertension. The margin of safety between a too high blood pressure leading to aneurysm rupture and a low blood pressure inducing cerebral ischemia is narrow. In addition, these patients often have some degree of myocardial or pulmonary dysfunction. Thus, invasive hemodynamic monitoring is indicated in all patients. This allows rapid treatment of hypertensive or hypotensive events. After anesthesia, early neurologic assessment is important to detect any complication associated with the procedure, before transfer to the intensive care unit.